Fully connected digital experiences are often discussed, but not as often demonstrated. Barton Community College connected and consolidated 14 different apps into one, creating a consistent enrollment process for students regardless of device or location. With the help of Enrollment Rx, Salesforce and Jitterbit, they achieved the coveted connected digital experience. “Jitterbit was the only integration solution that would be capable of doing this type of integration in real-time,” Michelle Kaiser, Dean of Information Services at Barton, said. Before embarking on this digital transformation, Barton has disparate enrollment systems, different based on a student’s device, location or stage in the process, but all of them needed to sync data with their system of record, Banner® by Ellucian. “Our main inefficiency was that our applications, although online, didn’t automatically feed into the Banner system,” said Charles Perkins, Dean of Institutional Effectiveness. “So, if we had 3,000 new students enroll this Fall, they all had to be hand entered, which created a greater chance for mistakes.” Not to mention the labor-intensive time and effort to manually enter information. The data is also more accurate now because the portal forms have proper prompts that drive students through the process and collect the right data. Plus, if new classes or curriculums are added, Barton can update the form builder only once and it replicates throughout the system. Not only does the new process make it easier for students to be admitted to Barton sign up, it also saves the college a huge cost. “We were able to get rid of a whole piece of software to save the college money. Not having the cost of software and people for data entry is about a $100,000 a year in savings. Education doesn’t stop with Barton students; both Perkins and Kaiser utilize Jitterbit University’s extensive training classes to get the most out of their new integrations. Turnover is also much easier to deal with when there’s a central place to get people up to speed. While better data, automated processes, faster employee ramp up time and cost savings are all tremendous benefits, it’s really the ability to reassess and rethink the entire student lifecycle that has given Barton the potential to expand. Disparate applications made for a disconnected, inefficient student enrollment experience. Manual data entry, both internally and externally by students, caused errors. Lag between applying and ability to enroll meant perspective students abandoned the process. Admissions process was restricted by legacy, incomplete systems. $100K in savings from reducing applications and manual data entry. More accurate data connected in real-time into Banner® accelerated registration. One application for entire enrollment process created a consistent, connected experience regardless of device or location. Jitterbit University helps ramp new employees faster. 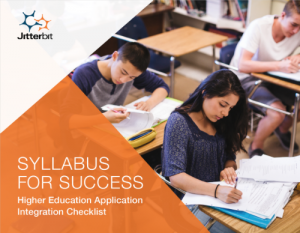 Over the course of 10 years working closely with schools such as Arizona State University, the University of Miami, and UCLA, Jitterbit has developed a syllabus for success in higher education application integration. Download it now!